Single loop: the gap is feedback to the way an existing model is being applied, improving the way it is being applied. For example in quality programmes measuring the deviation in outputs from the norm. The expectations against which the gap is identified are set by the intent behind the particular way in which the model is being applied. For example, was the treatment that had been planned for the patient carried out effectively? Double loop: the gap is feedback to the efficacy of the model itself, leading to improvements, refinements and adaptations to the model. The expectations against which the gap is identified are set by the intent behind the formation of the model itself. For example, were the right assumptions used in the way the care plan was itself constructed to treat these kinds of condition? 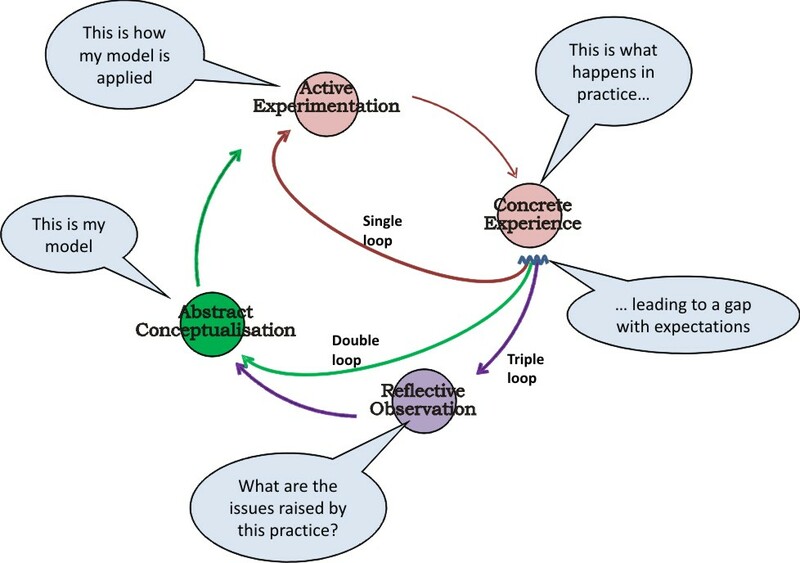 Triple loop: the gap is feedback on the effects generated in the situation experienced, whether or not those effects are consistent with the intent behind the model and its application. The expectations against which the gap is identified are set by the nature of the experience per se within its larger context. For example, did the outcome for the patient suggest that a different approach needed to be adopted in the way care plans were constructed for these kinds of situation. The difference between double-and triple-loop is subtle here. If we approach our expectations of the concrete experience in terms of supply-side and demand-side perspectives, then it is the demand-side perspective that distinguishes triple-loop learning, placing the primary emphasis on the value deficit associated with the asymmetric demand in the situation itself. The purpose of the ‘plus-one’ exercise is to provide a means of getting at what this deficit might be.
. A constructivist perspective on triple loop is to be found in Peschl, M. F. (2007). “Triple-loop learning as foundation for profound change, individual cultivation, and radical innovation: construction processes beyond scientific and rational knowledge.” Constructivist Foundations 2(2-3): 136-145.
. It was Argyris who popularised double loop: Argyris, C. and D. A. Schon (1974). Theory-in-Practice: increasing professional effectiveness. San Francisco, Jossey-Bass.